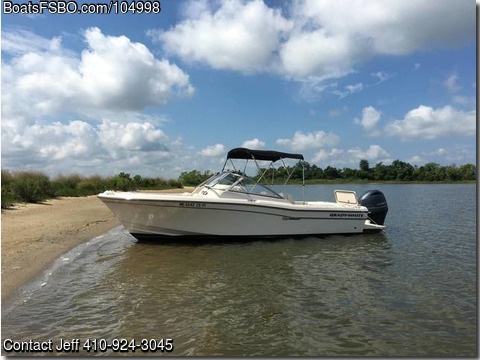 Boat is located in Easton,MD.Please contact the owner @ 410-924-3045..2017 Grady-White Freedom 225 w/Yamaha 200 four stroke, 49 hours. Always dealer maintained and stored. SST Prop, Multifunction Yamaha control panel, Garmin 9" Color chart plotter mounted in dash w/through hull depth transducer, compass, 2nd battery, tilt hydraulic steering, Deluxe Helm seat, Hydraulic trim tabs, fold away bench seat with cushion, bow cushions, cockpit bolsters, forward bolsters, black vista top with front and side curtains (never used), Black tonneau cover, Black bow cover, port sleeper seat, Fusion stereo BT w/remote, Wash down pump with hose - plus all std equipment.3 year extended Yamaha warranty.New 2018 Load-Rite aluminum tandem trailer 5200 lb.All CG safety equipment included, lines etc. Outstanding smooth and quiet ride in calm or chop, Achieves low 40's with excellent fuel economy, large 90+ gallon fuel capacity.